What is better on a hot day than a 30 foot wet, slippery slide? 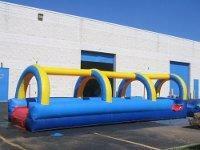 This is a 30' single lane slip n slide perfect for those hot summer days! Water runs through-out the length of the slide from the top side of the slide to ensure that every part becomes wet & slippery for your sliding pleasure. This wetness will ensure a slippery slide from start to finish. Come on in the water's great!